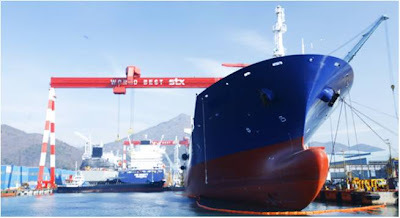 OFFSHOREKOREA: [Special Sponsor 4] STX Offshore & Shipbuilding Co., Ltd.
[Special Sponsor 4] STX Offshore & Shipbuilding Co., Ltd.
STX was established with the capital of KRW 180b April in 1967. At present, the number of employees amounts to 9,850, including employees of outsourcing company, as of June in 2012. The main businesses are shipbuilding, such as LNG/LPG ships, Containers, VLCCs, VLOCs, Special Ships, and offshore, like F(P)SO, FPUs, Drilling rigs, Support Vessels, LNG Floaters, Flexed Platforms. What’s more, the headquarters is in Changwon in Gyeongsangnam-do with Jinhae shipyard.